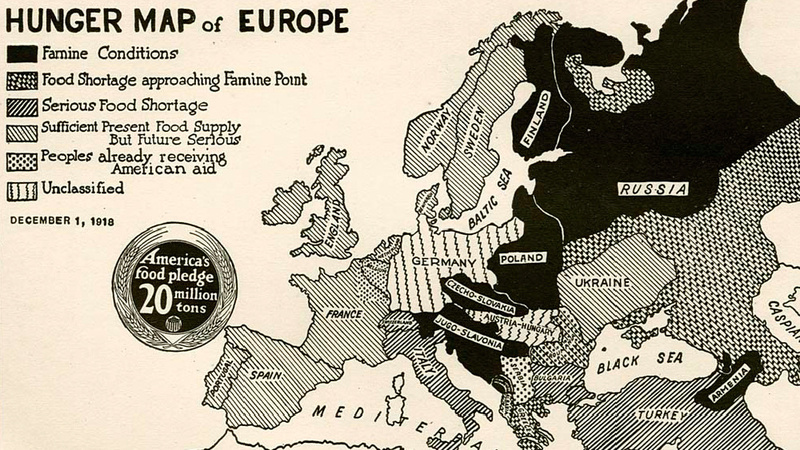 Exactly a century ago, a massive U.S. relief effort kept Europe, including communist Russia, from starving to death. This map shows the areas worst affected by famine, but ignores the food emergency in Germany. Drawn up between the Armistice and the Treaty of Versailles, it also shows a few intriguing countries and borders, never seen since. What a difference a century makes. On December 1st, this map of Europe will be exactly 100 years old. It portrays an almost unrecognisable place — a continent stalked by hunger and divided into countries that no longer exist. Strangely, some of those countries never properly existed at all. The map was not produced for European consumption – excusez le mot. Rather, its target audience was American. More specifically, the youth of America. It's the 1918 version of the age-old attempt to shame kids into eating their greens. Show your age by filling in the missing word in this sentence: "Finish your peas; there are kids starving in (…)" (1). However, there was a bit more politics involved as well. This map was published mere weeks after the end of the First World War. Exhausted by the war effort, much of Europe was suffering from food insecurity, and in some parts, people were dying of hunger. Text and photo come from www.bigthink.com - a very interesting website covering manyh topics.